Barack Obama should name the enemy: It’s the Republican Party. Republicans are your true enemy. 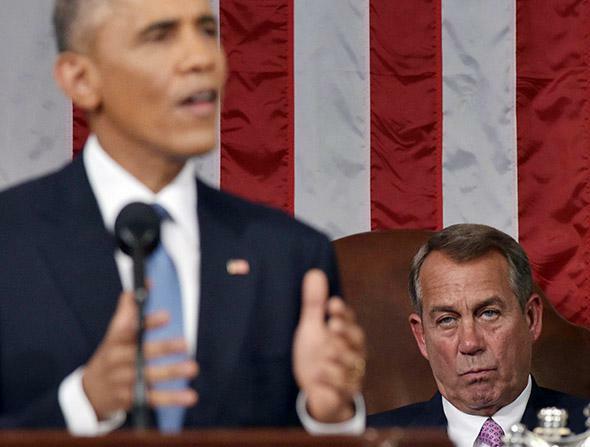 The opposition: House Speaker John Boehner listens to President Obama deliver the State of the Union address on Jan. 20, 2015, in Washington, D.C.
Sept. 11. Afghanistan. Iraq. Fort Hood. The ground zero mosque. ISIS. Paris. The next day, Obama gave a shout-out to the former Republican lieutenant governor of Illinois, which, he noted, was the home of the first Republican president. At a speech in Kansas, Obama pleaded for unity: “Whoever we are—Republican, Democrat … we all share a common vision for our future.” In a Jan. 23 interview with Vox, Obama praised the Republican governors of Alaska, Michigan, and Ohio. On Feb. 1, Obama was asked in an NBC interview about the mockery of him during the State of the Union. He shrugged it off as good-natured “ribbing” and changed the subject: “What I want us to focus on is the areas we have in common.” The next day, he sent his budget proposal to Congress. Republicans, determined to block his immigration agenda, were withholding money for the Department of Homeland Security. But Obama said these saboteurs didn’t represent the true GOP: “A large percentage of Republicans agree that we need comprehensive immigration reform.” Instead of using the fight for partisan advantage, Obama spread the blame to his own party. “Republicans and Democrats in Congress should not be playing politics” with the department’s funding, he warned. That’s how Obama treats his domestic adversaries. He doesn’t take the bait. He doesn’t define the whole opposition party by its worst elements. He rejects polarization. He emphasizes shared values. He reminds his own partisans that they, too, are sinners. Please. If we’re going to start calling out religious and political groups for extremism, we could start at home with Republicans. Too many of them spew animus. Too many foment sectarianism. Too many sit by, or make excuses, as others appeal to tribalism. If Obama were to treat them the way they say he should treat Islam—holding the entire faith accountable for its ugliest followers—they’d squeal nonstop about slander and demagogy. They’re lucky that’s not his style. Scott Walker’s recent troubles were entirely predictable. Obama does understand the nature of Islamic terrorism. And his careful words show he knows how to fight it. Rudy Giuliani is right about Obama’s patriotism, but not the way he thinks.